Gmail today announced new Gmail lab named “Apps Search” Lab by Apps Search team to search Docs and Sites within your Gmail Dashboard. This Gmail Lab feature is usually useful if you using Google Docs site. Gmail Apps Search help you to search Google Docs and Sites within your Gmail, thus you can save time. 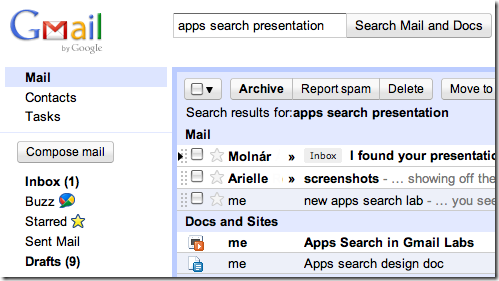 Here is a steps to How to Enable Apps Search in Gmail Lab. If you are not an Google Docs users, then you don’t need to use this feature at all. If you use Google Docs then continue for activating/enabling Apps Search lab. After doing the above steps, click “Save Changes” button. That’s it, now you successfully activated Apps Search Lab feature in Gmail. Now you can easily search Google Docs and Sites in Gmail itself. Before activating or Enabling Apps Search Lab feature in Gmail, here how Gmail search looks like. After Enabling Apps Search in Gmail lab it added Docs option in the search button as show in below image. See how the Apps Search lab displays search result when we search on Gmail dashboard. One more thing what you find with this lab is, they show spelling suggestion as we seen in Google search engine. In official announcement they said that,they will improve this apps in coming months. Anyway, for those who use Google Docs, then this Lab feature defiantly helpful.